Parker will expand the practice that serves mission-based clients in cultural organizations, public media, social services, higher education and private schools. Greenough Brand Storytellers, experts in messaging, media and marketing, named Jamie Parker chief mission officer. In this new role, Parker, who previously served as president, will expand the agency’s practice that serves mission-based clients in cultural organizations, public media, social services, higher education and private schools. Greenough’s work with mission-based organizations includes clients such as WBUR, Tufts University, Chapel Hill - Chauncy Hall School, New England Conservatory, The International Museum of World War II and WETA. Greenough’s services include brand positioning and messaging, media relations, internal organizational audits and fundraising and capital campaign support. 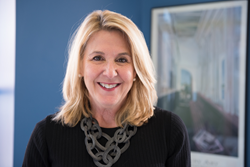 Prior to Greenough, Parker was vice president of marketing and communications at WGBH, where she helped increase its regional and national profile. Before that she was GM at Weber Shandwick Worldwide. Jamie has also served a number of organizations as a consultant, board member or committee member, including the Celebrity Series, the Isabella Stewart Gardner Museum, the Cam Neely Foundation for Cancer Care and the Ad Club’s Women’s Leadership Committee. For Jamie’s insights on the changing nonprofit community, read her latest blog post. Greenough Brand Storytellers builds brands through the power of storytelling and is nationally recognized for its award-winning public relations, social media and content marketing programs. Since 1999, Greenough has helped companies develop and implement marketing and communication programs that drive awareness, generate conversations and deliver qualified leads. For more information, visit http://www.greenough.biz or read our blog at http://www.greenough.biz/blog.